Groogar is a new search resource. It is not actually a search engine but a web directory. 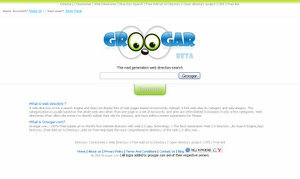 Groogar does not display a list of websites and pages based on keywords that the user supplies. Rather, it lists websites both by category and by subcategory. As it is explained online, this categorization process takes into account the site as a whole, and not just a couple of keywords, so theoretically the degree of relevance should be higher.